Online registration for the ISBC 2018 will remain open until December 6, 2018. On site registration will be available at the Phlocking on Friday, December 7th and on the day of the event at the E-Club. Registration cost online or at the Phlocking will be $10. The fee on the day of the event will be $15. Registration on the day of the event will be from Noon until 1:30 pm. A limited number of event T-shirts will be available for purchase on the day of the event. Online registration has been a great success and we anticipate a big turnout. Everyone is excited to “Party with a Purpose” and support the Eastern NC Make a Wish Foundation!! By now you know that EIPHC’s float didn’t make it to the parade since there was no parade. Lots of hours of labor and love were shared while crafting this baby! Even in its beginning stages, we knew we had a winner! The bright colorful shapes and letters on its sassy frame display love, hope, happiness and whacky Christmas phun! No way we could lose! Still wanting to share it, our float remains intact and is ready to make a grand appearance at the upcoming Island Santa Bar Crawl on Saturday, December 8. Don’t miss it! And, a “special thanks” goes to the many volunteers who offered their valuable time and extraordinary talents for over two months on this labor of love! YOU ROCK! Listen up, it’s the perfect time for you to finish out 2018 with a big bang! On December 7 we’ll phlock at the Emerald Club for our annual Christmas party. Be sure to wear red or green or you’ll get Grinched! If you’re not a member yet, you can join at the party. Also, you can register there for the first ever Island Santa Bar Crawl to be held the following day, December 8! Visit our website for details on these and other events! The online registration for the Island Santa Bar Crawl is up and running at www.emeraldisleparrotheads.com. Be sure to register early and purchase your event T-Shirt. 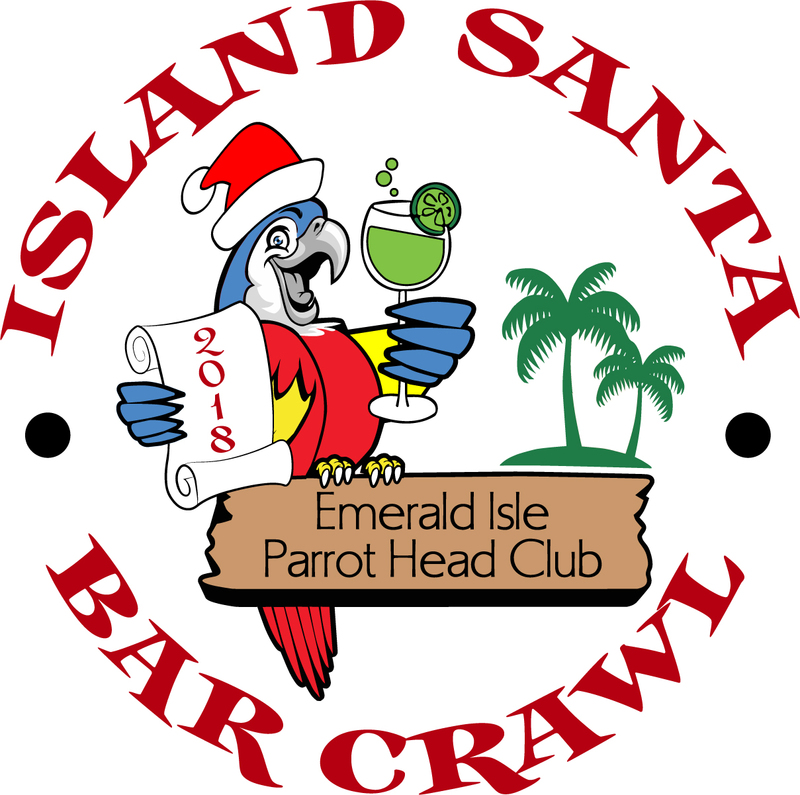 The Island Santa Bar Crawl will be held on Saturday, Dec. 8, 2018 from 2-6pm. Plan to stay at the EClub after the crawl for music, drinks and a food truck. All proceeds from the event will go to the Eastern NC Make A Wish Foundation. Business sponsors are still being accepted. Contact Jimi Crampton at jimic1023@gmail.com or 919-971-9603 for additional information about supporting this GREAT cause!